Explanation: Engraved in rock, these ancient petroglyphs are abundant in the Teimareh valley, located in the Zagros Mountains of central Iran. They likely tell a tale of hunters and animals found in the middle eastern valley 6,000 years ago or more, etched by artists in a prehistoric age. In the night sky above are star trails etched by the rotation of planet Earth during the long composite exposure made with a modern digital camera. On the left, the center of the star trail arcs is the North Celestial Pole (NCP), the extension of Earth's axis into space. Polaris, the North Star, leaves the bright, short, stubby trail closest to the NCP. 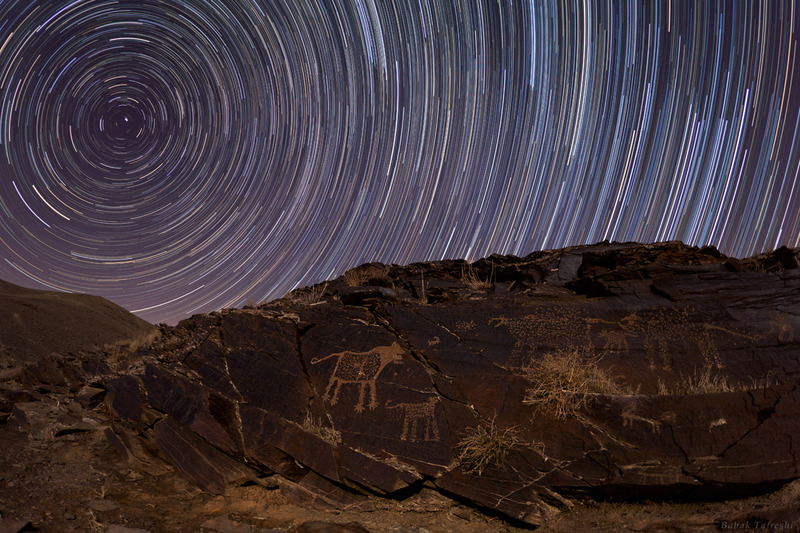 But when these petroglyphs were carved, Polaris would have made a long arc through the night. Since the Earth's rotation axis precesses like a wobbling top, 6,000 years ago the NCP was near the border of the constellations Draco and Ursa Major, some 30 degrees from its current location in planet Earth's sky.